Available in Google Drive as a PDF. The pattern should be easily adaptable for different stitches and yarn weights. The author wanted headbands that weren’t tight or uncomfortable like store bought headbands. These are snug, but not too tight and stay in place well. Starting: I like to build up my loops on my thumb so I don’t have a knotted mess of loops at my start. See tutorial “Build Up Start For Nalbinding Stitches with Many Loops” for more info. Ending: To help blend the end of your work in, tighten the last several loops of your stitches by pulling on the top of the loop and pull the loop yarn “out” of the front of the fabric. I usually tighten 3-4 stitches and make them gradually smaller, but do as many as you see fit. To help blend in the beginning of your work, you’ll also want to tighten several stitches. Turn your work to the “wrong” side and pull at the top loop of each stitch to tighten – just like you did above. You may end up with a last loop that won’t tighten that way. I have to pull on the center part of the stitch to get the last loop worked in. Or if it gives you too much trouble, tuck that loop in with the end of the string. Make a chain of Finnish 2+2 stitches just a bit shorter than the circumference of your head – by ½ to 1 inch or 1 to 2.5 cm. It’s recommended that you make your stitches fairly tight so your headband will hold to your head. But not so tight you hands hurt from making stitches. You may have to untwist the chain and it will want to retwist. Be careful not to stretch your chain – because new rows will make it tighten again and you want the best measurement. Now connect your chain so you can work in the round. Make sure your chain isn’t twisted. A. 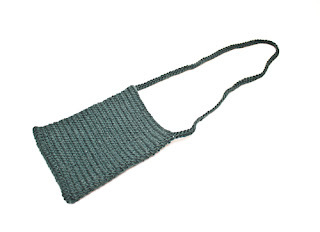 If you are making a simple headband (no shaping) – work 4 rows or to a width of about 1.5 inches or 3.5 cm. Break off your working yarn. Tighten your end stitches and work in threads. Your headband is ready to wear! B. If you’re making a headband with shaping – work 3 rows, or the number of rows to reach a width of 1 to 1.5 inches (or 2.5 to 3.5 cm). Place a marker on the top of the work (where you ended it). *This will be important to know when we add a shaping row on each side. When you work the bottom/first row – it will be different to avoid odd looking holes in your work. Turn your work so the top row stitch marker is to the back and the other side of the circle is facing you. On the top row, attach our new row at the left hand marker where there was a fold. You’ll start from the other side, since you work right to left. Work to the other fold marker. Work the same shaping row for this side – marker to marker. If the back of your stitches sticks out a bit more than the other rows, when you’re done – give the row a tug and they’ll even out. Your shaping rows should look like this. Tighten your end stitches and work in threads. Your headband is now ready to wear. Enjoy! I think I’ve made close to 20 of these for Christmas. (I don’t know for sure how many because I’ve given several away before I could photograph them.) These little mitten ornaments are perfect for using up scraps and take me 1-2 hours to make (depending on how many distractions there are at the time.) Since my pattern was only written on an index card, I figured writing it down here would be a good thing. 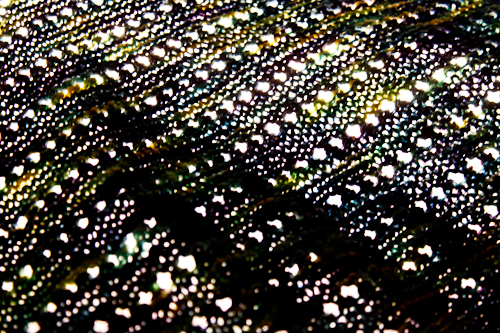 (Paper and I have a tendency to loose each other…) And you all can enjoy the pattern too. Round 7: Work 6 sts. Chain 6 stitches (for thumb hole). Connect work in 5th or 6th stitch of previous row, and work the rest of the way around. Finish off. Tie a loop of string to the bottom of your mitten – so it can hang as an ornament. Connect a new thread 1 stitch into a row on the thumb hole. Work 3 rounds. (Just be careful to only use the stitches in the thumb hole, and not into the mitten. You don’t want a really wide thumb.) Decrease around on next row. Finish off and tuck in threads. Enjoy your new mitten ornament! Merry Christmas! 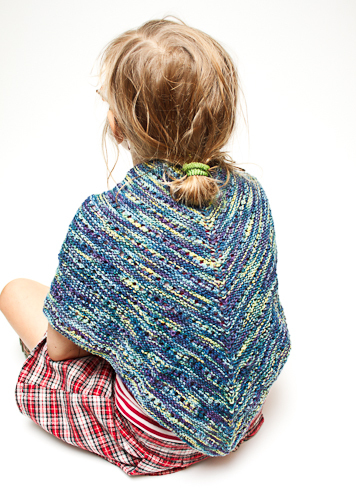 After several iterations at working through this, I can now present – the Simple Garter Lacy Shawlette. 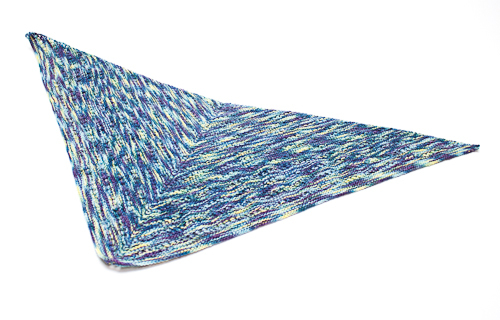 It’s a variant of the Simple Yet Effective Shawl by Laura Chau. And this variant has her blessing. I used a lace row. It’s meant to use a skein of sock yarn. I add in stitch markers to it’s really a brainless knit, even with the lace row. I don’t specify the bind off. I don’t see that a purl bind off would be of benefit here. Go to step 2 of the pattern below. So I grouped them in parenthesis for easy identification. You’ll recognize increase rows because of the stitch marker that is just past the first stitch on your needle. Repeat rows #3 and #4 – three more times. (for a total of 10 rows in the pattern). Bind off as you see fit when you find there won’t be enough yarn for another 10 row pattern. After my test class for “Beginning Nalbinding” – we found there isn’t enough time to cover color changes. 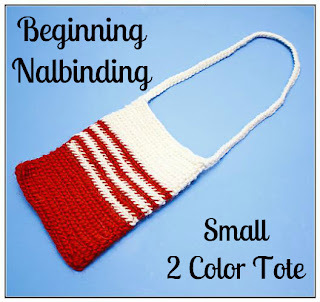 (Ah well – this just leaves more room for more classes next year – nalbinding I, nalbinding II,…nalbinding X) So I simplified the pattern and will have 2 simple tote patterns now. One with stripes and one even simpler with out stripes. So I present the new little pattern! Enjoy! So without further ado, I present the Beginning Nalbinding – Small 2 Color Tote Pattern. Enjoy!